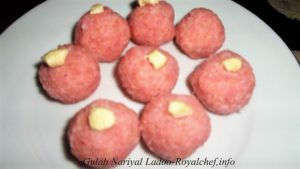 This is recipe for making at home sweet and delicious Red Rose Coconut Ladoo. This Lal Gulab Nariyal Ladoo, which is prepared using desiccated coconut, condensed milk and rose essence as the main ingredients can also make a great addition to your annual Diwali Faral Sweets. Preparation: First prepare the Condensed Milk and keep it aside. Heat the Ghee in a Kadai and add the Desiccated Coconut and saute for 10 minutes on a low flame. Keep steering and the color of Desiccated Coconut should not be change. Mix the Condensed Milk, Milk, Rose Essence and Red Rose Syrup and then add into Desiccated Coconut, mix it well and saute for 5 minutes on a low flame. Remove the kadai and keep it aside for cooling. Prepare equal size 12 Ladoo roll them in a Desiccated Coconut and garnish with dry fruits and keep them in a stainless steel container. Tip: For preparation of Condensed Milk Heat the ½ Liter Milk and add ¾ Cup Sugar and pinch of Soda. Mix it well and cook until the Milk become thick.